Anaheim Lake Buyan is located on the hillside of Lake Buyan which situated in the North of Bali. 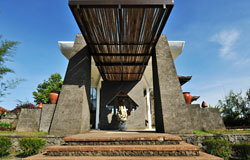 Simple yet sustainable villa settled peacefully in the lush unexplored central hills of North Bali. Located about 2 hours driving from Bali’s International airport in Denpasar through a scenic way to Lake Buyan, Anaheim offers a simple design villa and a comfortable villa living in the secluded area of Bali, perfect for those who seek adventure and nature lovers. The villas boast superb views of the rolling hills down to the Oldest Bali Capital, overlooking Vegetable & flower Garden and jungle in the distance. Villa settled at a comfortable distance from one another guaranteeing genuine privacy. The villas are very spacious with a tropical hardwood floors in the bed/living room and a elegant cream marble in the bathroom. King size beds, couches made from tropical hardwood, high quality cotton and linen and local artworks work together to produce a warm interior. The Gazebo is setting in romantic view to our green and beautiful garden. Your Lovely family are welcome at Anaheim Lake Buyan Villas, Two storey Villas with separate bath room, Twin bed for your lovely child at down stair with private Gazebo and Bath room set with fire places in the room a completely relaxing and make your night more warm though was in cold places. King size Bed settled on up stair complete with individual gazebo overlooking to all around views and private bath room with hot water. Green and beautiful garden with kind of colorful flowers combine with Local tropical plant inviting you to feel the Nature sense on this area. The Buyan (named of lake just in front of Anaheim Villas) restaurant is only Restaurant facing to the Lake Buyan view and lush of tropical jungle in the central Balinese plateau. From the Restaurant your eyes will have miles of green forest with three Volcanoes as background. It is truly a dream like environment where your sight and taste will be spoilt. Our Restaurant open for Breakfast, Lunch and Dinner and no dress-code is required. Hotel guests have first priority on seating however outside guests are always welcome. We serve Indonesian, Asian and Fusion dishes using as much as possible our home grown vegetables and fruits. In the evening an organic menu is offered while guests have a choice of delectable dishes for lunch. We store a number of excellent European and New World wines in our cellar to accompany lunches and dinners. Indonesian herbs and spices are a key ingredient of our treatments for total relaxation and rejuvenation. The spa is a privileged place to abandon your body to the secular secrets of Balinese well-being. Anaheim spa (formerly Kalaspa) is one Spa Destination in north Bali; we offer several of treatment with completely equipment: Sauna, Jacuzzi, body treatment. The interior and exterior were blended into the uniquely beautiful nature, thanks to the use of local material and the manner in which the spa integrates with this privileged part of paradise.